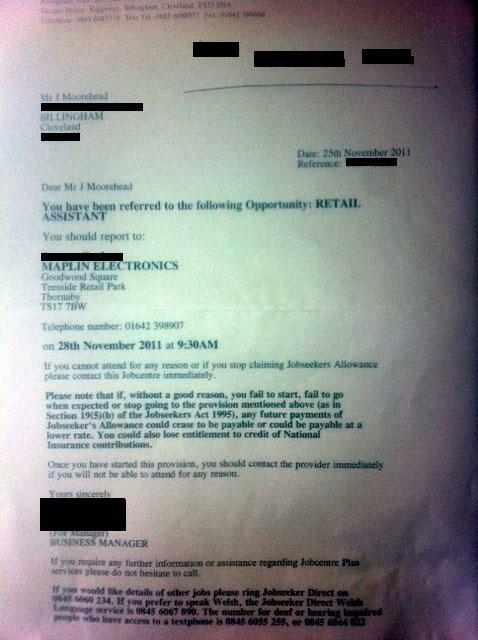 The standard workfare letters being sent out by Department of Work and Pensions cast the scheme as compulsory and do not explain that claimants can leave their placements without sanction in the first week, a Channel 4 News investigation has confirmed. The claimant in Jackie Long’s film said he voted Conservative at the last election. Exactly what I’d expect from this despicable Government. The government are now blocking FOI requests, in an attempt to keep the businesses exploiting the unemployed for profit anonymous. I can see the word “could” in that letter. If it had said “will” I’d have believed you. But it doesn’t. It is voluntary. Once you agree to do it, you must honour that agreement. What about this is so difficult for you to understand? Didn’t see fit to run this story today? @Geoff: Imagine you received a “could” letter from your bank — with that paragraph in bold. Would you sit there in your smugness or act in the way they suggested? And would you play the “could” vs “will” semantics game with your only £50 per month? Thanks Laurence, for pointing out to Geoff the bleeding obvious! The very concept of voluntary work is that it is consistently voluntary. If I voluntarily decide to help out at a business, the business has no contractual requirement for me to turn up and actually do anything and I have no contractual arrangement that requires the business to give me work, otherwise I would be an employee or worker, not a volunteer. The voluntary act of signing a contract has nothing to do with whether the work itself is voluntary otherwise every legal employee in the UK would be classed as a volunteer purely because they voluntarily signed their contract of employment, which is obviously ridiculous. Or to put it in very simple terms, I suspect you are a bit of an arse-griblet. @Laurence, nice straw man there. You are deliberately comparing apples with oranges. Are you seriously equating a voluntary 2 week work placement with a mortgage? Really? But Geoff, its not exactly clear is it. Its about as close as you can get to saying these ‘oportunitys’ are mandatory as it is possible to get without using that word. The average person reading that letter would have no idea that the position is in fact voluntary. This is the usual Gobbledeygook you come to expect from the anally retentive wordsmiths of the Civil Service! I expect , in the near future, we will be advised to read the small print before agreeing/or not! Geoff In my opinion I think its says could and not will/would because it is to deliberately mislead people that will never be involved in the scheme into thinking it is fair when it’s not. It’s free labour and the only people it helps are the rich companies, which is who the tories always help. Tories have always been very harsh on the poorer in society and penalise them instead of helping them. This garbage is nothing new. Thatcher did the same only it was for a wage of £1 per hour. Guy worked for Tesco for 40 hours he had three children to keep.